Tails of Valor brought some of their dogs for a ‘meet and greet’ at the Golf Classic. 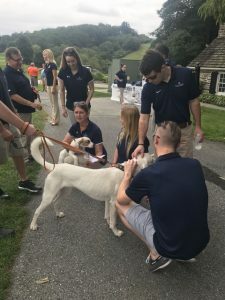 WEST CHESTER — The Frank A. McKee Golf Classic 2018 raised a record $60,000 for its chosen charity, the Tails of Valor, Paws of Honor Program, a local organization that provides service canines to veterans suffering from Post Traumatic Stress, Traumatic Brain Injury and physical disabilities. The Classic was held on Sept. 20 at the Broad Run Country Club in West Chester, Pa., and brought out 132 golfers to support the cause. Tails of Valor rescues dogs from area shelters and trains them to follow more than 40 commands, which correlate to symptoms typically experienced by veterans. Each dog is named in honor of a fallen soldier. Each year, the McKee Golf Classic benefits a charity. Past recipients have included Project Healing Waters, the Navy Seal Foundation and the SPCA. Tails of Valor is based out of Coopersburg, Pa. For more information, visit www.tailsofvalor.org. Headquartered in Springfield, Pa., The McKee Group is a family business with a 70-year history of leadership in residential and commercial building. The company created its first 55+ community more than 45 years ago, and today is known as an innovator of active adult clubhouse communities in Delaware, Pennsylvania, New Jersey and Maryland. For more information about The McKee Group, contact (610) 604-9800 or visit www.mckeebuilders.com.